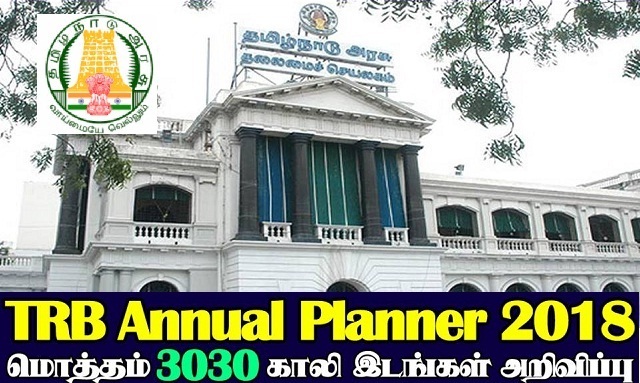 Tamilnadu TRB Annual Planner 2018 2019 Released for 3030 Agricultural Instructor, Lecturer in Government Polytechnic Colleges, Assistant Professor for Government Arts and Science Colleges and Colleges of Education, Assistant Elementary Educational Officer & Tamil Nadu Teacher Eligibility Test - Paper-I & II Posts | Teachers Annual Planner Board Job Vacancies 2018 Download Through Official website trb.tn.nic.in. The Interested Candidates Refer TRB Annual Planner 2018 after carefully reading the advertisement regarding the process of Name of the Post, No. of Vacancies, Date of Notification, Date of Examination & Date of Result etc. The above schedule is a tentative programme to be followed by the Teachers Recruitment Board. This is only for information to the candidates to get prepared for the examination. TRB reserves its right to add or remove or modify any recruitment in the above said planner and also to postpone or advance any of dates mentioned in the planner. Vacancies mentioned are tentative. It is subject to change at the time of notification or before the final selection. Scheme of examination and syllabus will be made available on TRB’s website www.trb.tn.nic.in, at the time of notification. Please visit TRB's website and the newspapers/media for latest information/notifications. ** Subject to the outcome of court cases. First and Second World War, Cold War, etc. Income Tax Authorities, Powers, etc. Tissue CulturePrimary cultures derived from plant, animal and human tissues, Maintenance of cell lines; Artifical Insemination technology. Pre-Nannaya, Nannaya his Literary Style. Definititoin of Folk Lore and Folk Literature, classification of Folk-Literature, Folk song, Ballad, Folk tale and Harikatha, Mythological Folk Songs, Historical Folk songs. Classification and organization of data collected classification. Communication, Food Science, Dietetics, Nutrition needs, Community Nutrition. Sources of consumer Information and protection.